Matthew 21:1-11 As Jesus and the disciples approached Jerusalem, they came to the town of Bethphage on the Mount of Olives. Jesus sent two of them on ahead. 2 "Go into the village over there," He said. "As soon as you enter it, you will see a donkey tied there, with its colt beside it. Untie them and bring them to Me. 3 If anyone asks what you are doing, just say, 'The Lord needs them,' and he will immediately let you take them." 4 This took place to fulfill the prophecy that said, 5 "Tell the people of Jerusalem, 'Look, your King is coming to you. He is humble, riding on a donkey--riding on a donkey's colt.'" 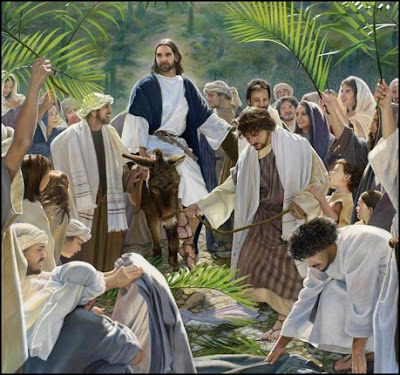 8 Most of the crowd spread their garments on the road ahead of Him, and others cut branches from the trees and spread them on the road. 9 Jesus was in the center of the procession, and the people all around Him were shouting, "Praise God for the Son of David! Blessings on the One who comes in the name of the LORD! Praise God in highest heaven!" 10 The entire city of Jerusalem was in an uproar as He entered. "Who is this?" they asked. 11 And the crowds replied, "It's Jesus, the prophet from Nazareth in Galilee." The people of Jerusalem are looking for a ruler that who would give them some relief from the rule of the Romans, so when Jesus came riding into town looking like a king they were ready to sing His praises. They were so ready that they missed the symbolism, the fact that Jesus rode a donkey meant that he hadn't come to war against Rome, but still they were hungry for change and their hopes were high. Was king David's throne about to be re-established? Zechariah 9:9-10 Rejoice, O people of Zion! Shout in triumph, O people of Jerusalem! Look, your King is coming to you. He is righteous and victorious, yet He is humble, riding on a donkey--riding on a donkey's colt. Talk about an anti-climatic moment! Jesus doesn't throw anybody out of the temple, he doesn't start a riot or even give a stirring speech. He just looks around and leaves, the crowd calms down and it is all over, talk about a lost opportunity! The crowd would never be as pro-Jesus as they were that day and by the end of the week they would be cheering for His execution. Jesus came to help them but not with the temporary problem that they wanted help with. His mission was to help them with an eternal problem that nobody else could fix. He enters Jerusalem to complete the mission that He came to earth to accomplish. Isaiah 29:13 “These people say they are mine. They honor me with their lips, but their hearts are far from me." The crowds welcomed a Jesus that wouldn't ask for much of them. They welcomed a Jesus that would serve them and give them a better life now. They didn't want a Jesus that required them to do anything and wanted to be their Lord. I have welcomed Jesus as my Messiah but that's not all, I also need to welcome him into my life and allow him to reign as king, He didn't come as the Messiah so that I could go to heaven without any personal sacrifice. My life needs to be devoted to my king and my loyalty to him should be obvious in the way that I serve him and give my life for his agenda. Have you welcomed Jesus to your life? Did you welcome him for who he really is or for who you wanted him to be?